CAST Software’s wysiwyg lighting design and previsualisation software has been instrumental in bringing one of the world’s most popular TV shows to Israel. Having first aired in Japan in 1997, Ninja Warrior has rapidly become a must-watch TV show around the globe. The format requires contestants to use a combination of strength, stamina, skill and guile to attempt to complete an extensive obstacle course. The most recent country to join the franchise is Israel, with the Ninja Israelshow debuting in July this year. The set for Ninja Israel is the ancient port of Haifa. An atmospheric location, it is transformed for the show by an extensive lighting installation that features over 4.5 tons of trusses together with no fewer than 800 fixtures controlled by a Compulite Vector Blue (http://www.compulite.com/products/consoles/vector-family/vector-blue) console and 350 conventional fixtures controlled by a Compulite Vector Ultra Violet (http://www.compulite.com/products/consoles/vector-family/vector-ultra-violet) console using 21 DMX universes and Compulite e-Port 41 (http://www.compulite.com/products/ethernet/eport-41) converters were used. An Ethernet network provided the required connectivity. Entrusted with the lighting design were world-renowned LDs Ofer Jacobi and Avi-Yona Bueno (aka Bambi). According to Jacobi, designing the lighting for Ninja Israel was challenging because of the enormous location. 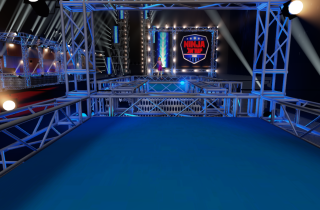 The set lighting for the obstacle course needed to be combined with, and balanced against, the existing industrial lighting for the port complex as well as the television lighting. Jacobi and Bueno turned to freelance lighting programmer/operator Ronen Ben-Harosh – an acknowledged master of Vector programming, with numerous theatre, opera, dance and TV events among his credits - for the production, not least for his expertise in 3D simulation programming using CAST Software’s wysiwyg.He also works for Danor Theatre & Studio Systems, Compulite's official distributor in Israel. Ben Harosh noted the difficulties involved with the incredible size – 150 metres x 60 metres – of the set, and the significant challenges involved in the mix of fixture types. "When Ofer Jacobi told me that we would be doing this project together, we knew that a 3D simulation would help us choose the lighting set and show Keshet TV's managers how it would eventually look in real life. The maps I took out from wysiwyg helped me and the crew to set the lights very easily,” said Ben-Harosh. “With a lighting set this huge and this complex, and working to very tight timescales, there is absolutely no room for error,” said Dino Mazza, Product Manager for wysiwygat CAST Software. The premiere of Ninja Israelwas a substantial success for Channel 12 (Keshet TV), with an excited live audience joined by a multitude of TV viewers to give the show great ratings. 400x ParLed and RGBW for all The Trusses. Video, images and renders: © Ronen Ben-Harosh.